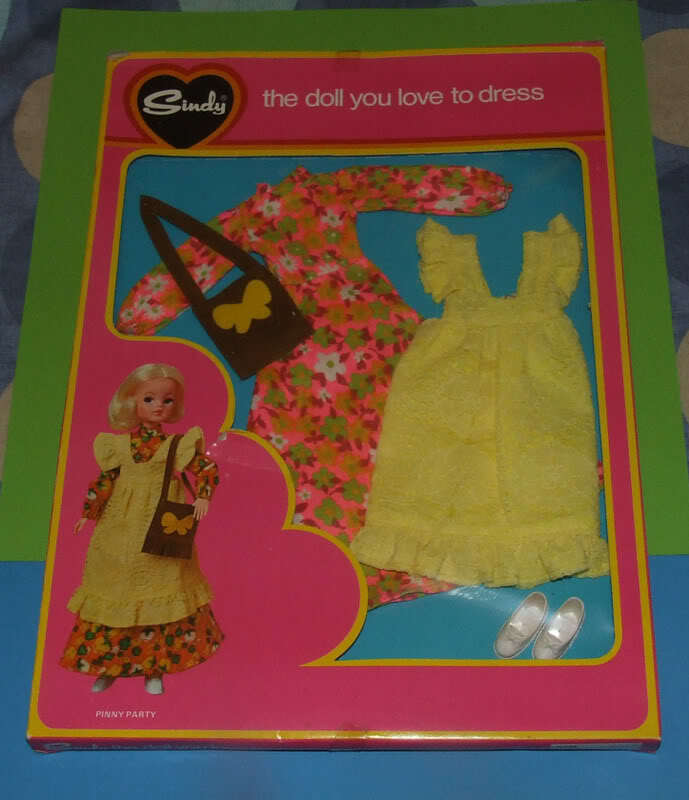 As a girl, I loved Sindy and still have all of my own Sindy dolls and clothes plus many others that had belonged to my Aunties before me (theirs being the original Sindy set dolls and clothes). I would not consider myself to be a serious collector; more someone who has a soft-spot for Sindy and collects whatever takes my fancy! 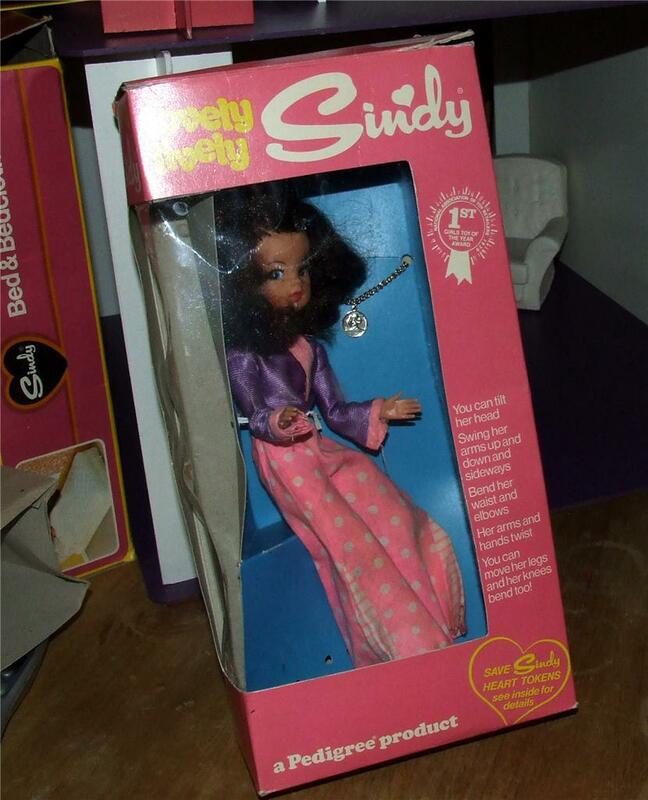 I am on the other hand, an avid car-booter and have always looked out for Sindy stuff, which I have either added to my own horde or sold on, over the years. Some years ago, I used to advertise in a local collectors’ magazine for Sindy and other small dolls. 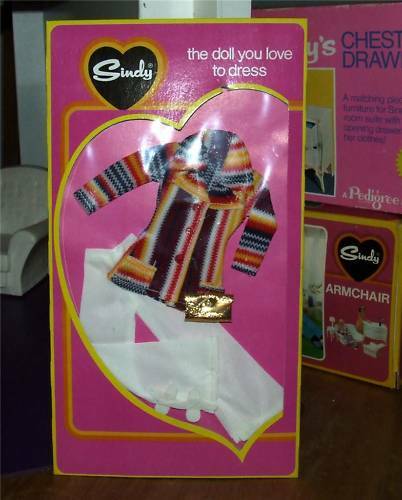 One day, I received a phone call from a lady telling me she had won a Sindy competition in 1973 or 74 and still had her entire prize, which comprised pretty much of the full range of Sindy items from that year. She told me she was interested in selling it and so I arranged to visit her. I went to her house where she had laid out the prize items for me to see. 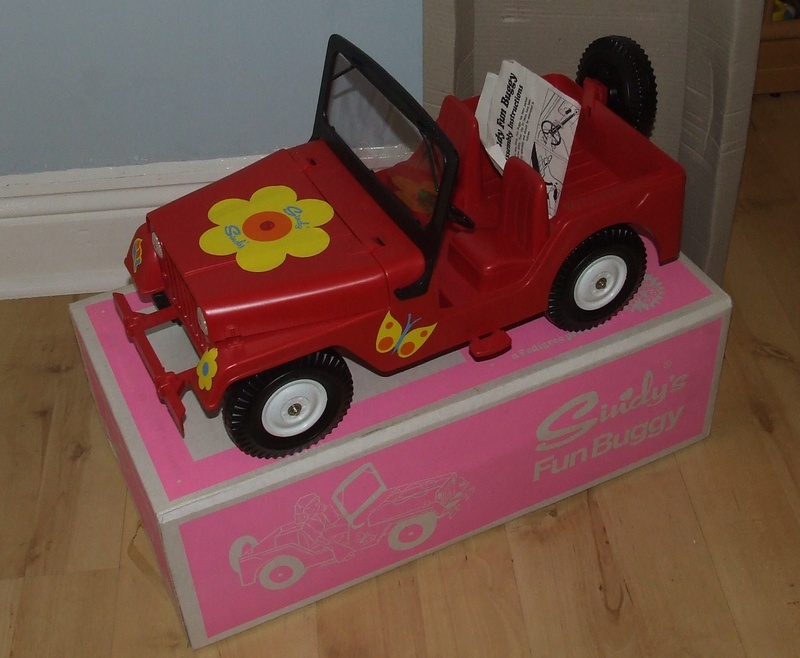 There was the boxed horse, fun buggy, settee, armchair, sideboard, hairdryer, dressing table, bedside lamp and tray set, wardrobe, chest of drawers and bed. 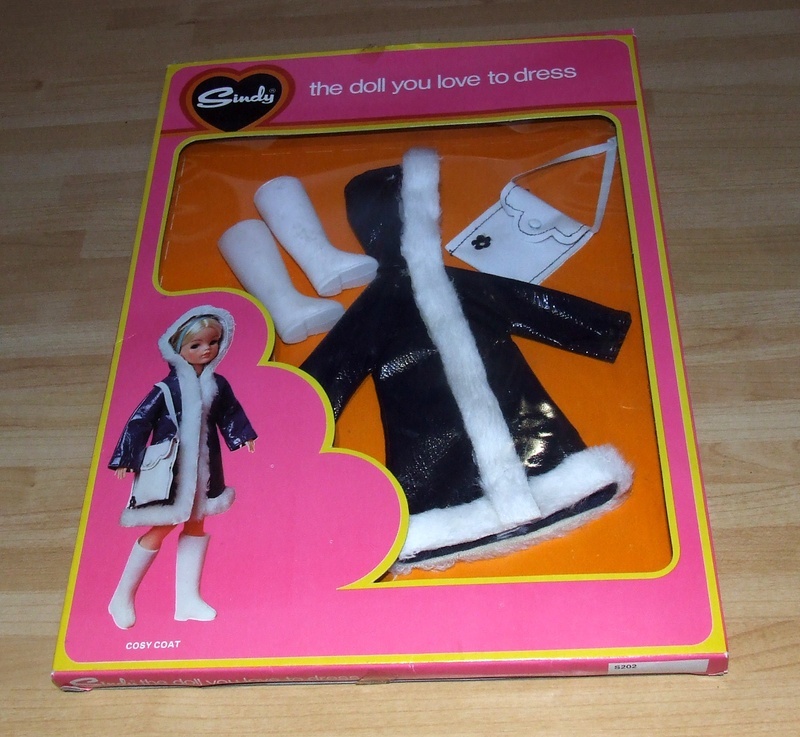 She also had a blonde gauntlet doll (unboxed) and a range of that year’s outfits. The outfits were: 'Cosy Coat', 'Wavy Navy', 'Sleep Tight', 'Blazer Beauty', 'Casual Day', 'Negligee', 'Red Flares', 'Sweater & Trousers', 'Zing a Ding', 'Party Date', and 'Pinny Party' . The outfits were unpackaged – she had removed them from their packets and amazingly enough, several of the outfits were duplicated ('Cosy Coat', 'Zing a Ding' to name just a couple!). 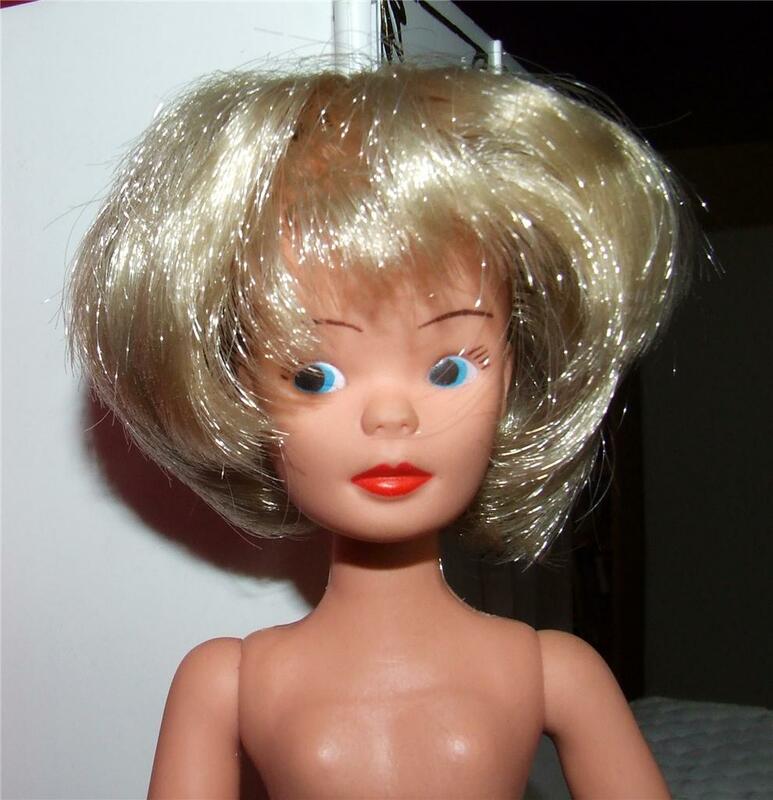 Her story was that in 1974, she had entered a Kellogg's Sindy competition where you had to think of a slogan for Sindy. She entered and heard nothing for almost ten months. 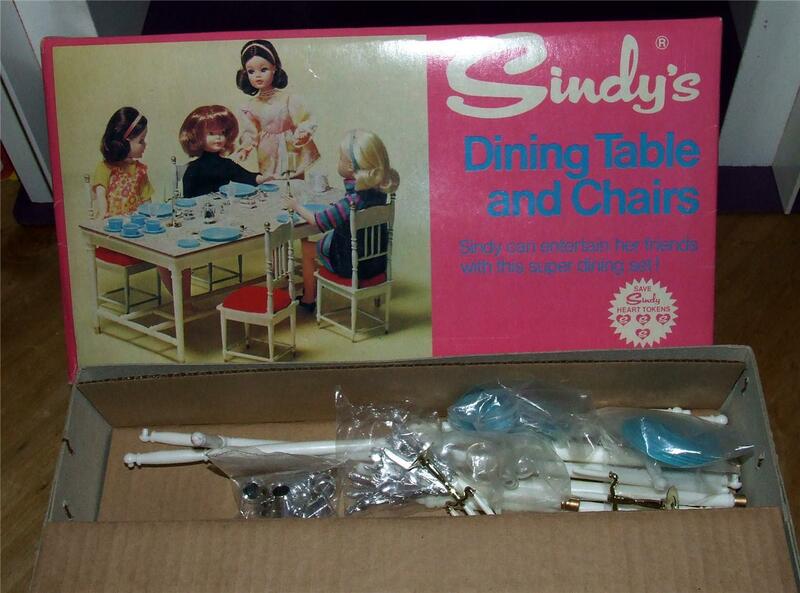 Then, one day, she returned home from school to find a huge parcel full of Sindy items on her doorstep. However, a lot of time had passed since she had entered the competition, in which she had started high school and had more or less stopped playing with Sindy. 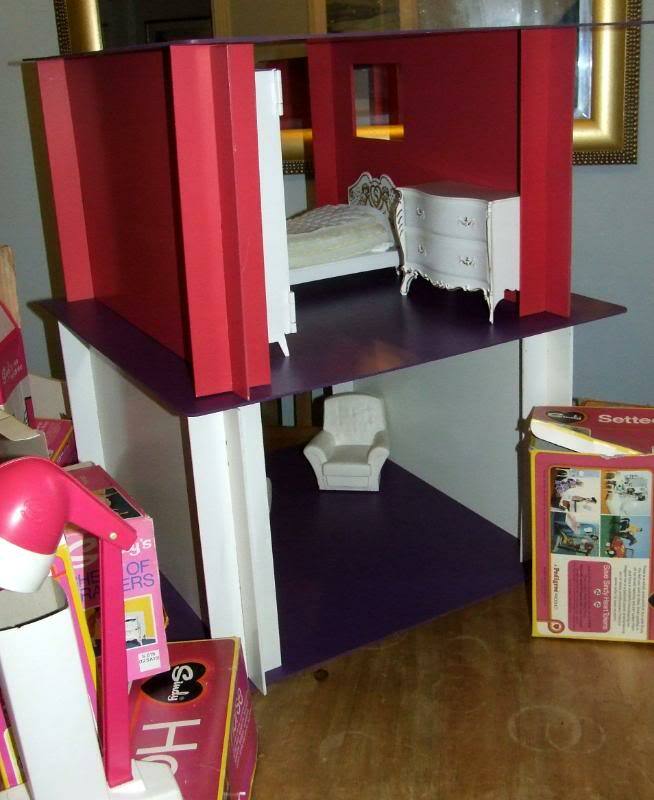 Therefore, her parents boxed up the items and put them in the loft to wait to be discovered by the next generation. However, about a year later, I received another call from a lady, telling me that she had won a competition in 1974, waited for almost a year, then arrived home from school to find a huge box on her doorstep! I reminded her that we had already spoken and that I had been to see her marvellous prize. She insisted that I had not!!! She described the contents of her prize, which were exactly the same as before, but then told me that the outfits she had were boxed! Her gauntlet doll was also boxed and was a brunette, as opposed to a blonde! I simply couldn’t believe it! Two prize winners within a 20 mile radius. Neither of whom had ever married or had children and both of whom had seen my advertisement in the collectors’ magazine. I arranged to see her and went to her home to see her items. She told me that she had never really played with the prize (due to the time that had passed between entering and winning the competition). She merely removed the heart tokens to send off for June!! She agreed to sell me the items and I was delighted. As I was about to leave, she remembered there had been a make-shift house with the items, in bright pink, white and purple and asked if I wanted it. I had never heard of the house but was glad to include it. She told me that the house had been sent with the items and she presumed that it had been put together as an after-thought in which to house the furniture! She had never tried to assemble it as it had no instructions. I kept and admired the items for many years, then we moved house and I had another child and I lost my ‘Sindy display room. Then, last year, my husband was made redundant and I needed to raise money for Christmas, so felt that it was best to part with these lovely items. Not an easy decision, but needs must. I therefore sold the items over the 2010 Christmas period (as some of you may have seen!!). 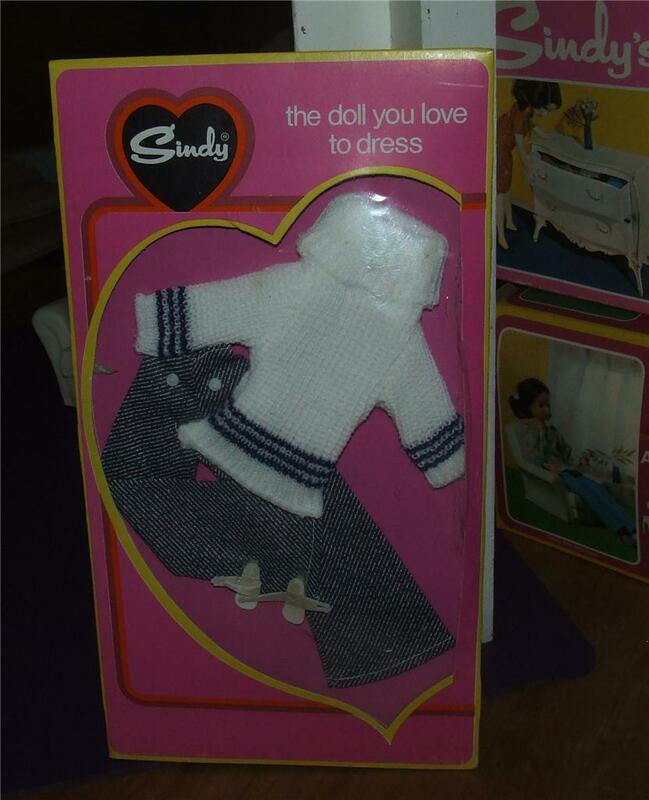 Then, two weeks ago, I bumped into a lady I know who has a regular stall at my local car-boot sale and she told me that she knew someone with some Sindy items to sell. 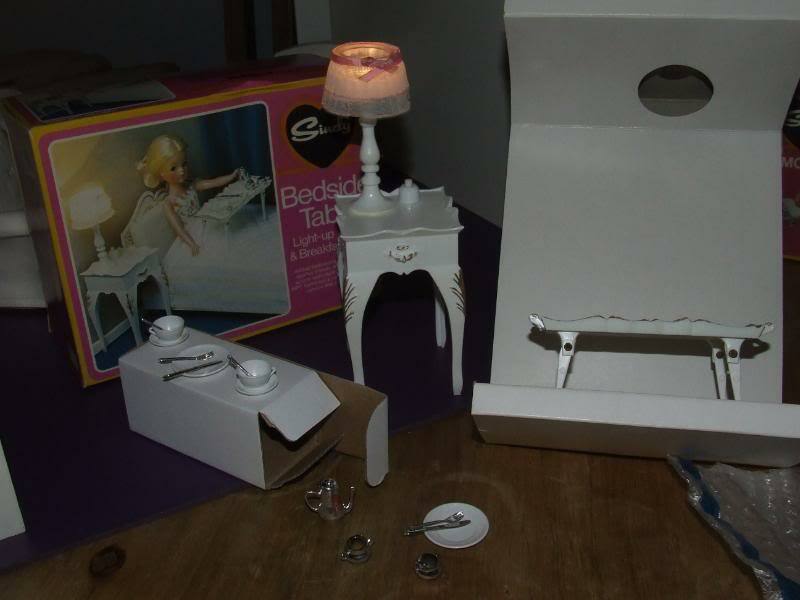 I went to see him and he told me he’d come across some Sindy things in a house clearance and would bring them to show me the following week. So, this Thursday, I went to see him and when he opened his car boot, I simply couldn’t believe my eyes!!! There was the competition prize again!! 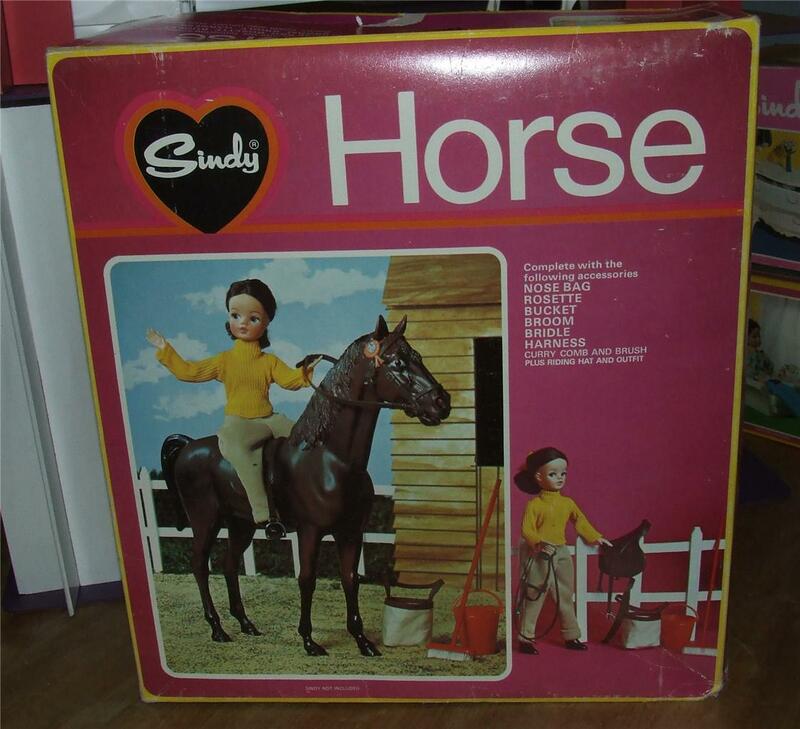 All the boxed furniture mentioned above as well as the boxed horse and fun buggy and most of the above mentioned outfits (which are not boxed/carded), although sadly no dolls nor house. I didn’t ask him about the house as he probably chucked it straight into a skip, not realising it was part of the collection (eek!). I bought the stuff from him – amazed to have seen it for a third time and went home in a dream. The items are not in as good condition as the first two winner’s lots, but despite this, I don’t believe that they were played with much as they are pretty much complete. It certainly made me wonder how many competition winners there had been. I reckon there must have been lots of little girls who won this prize, though oddly, cannot find any record of the Kellogg's competition, neither online nor in any of my Sindy reference books. My theory is that perhaps Pedigree changed the packaging at the end of 1974? and were keen to get rid of many items in the redundant packaging. I do wonder if this was the case? I don’t suppose I will keep the latest lot of stuff, as my husband still does not have regular work and times have been hard for us (plus I still don’t have the space in which to display them!) Still, I’m sure that they will bring lots of pleasure to someone and I am just happy to share this incredible tale with people who I hope will be amazed and interested to read it. P.S. 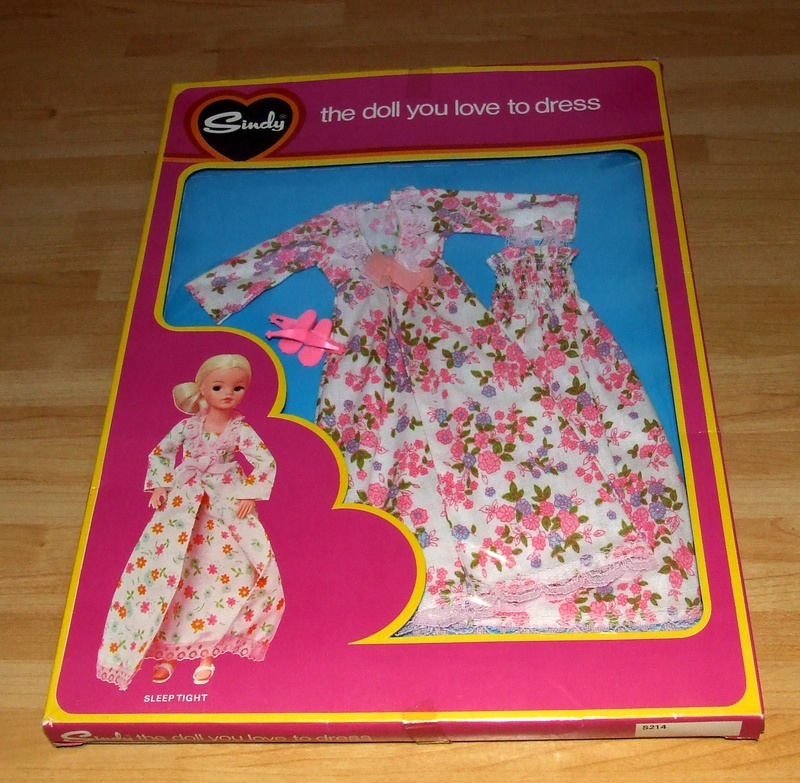 I once found a Mitzi doll on a car-boot – but that’s another story! Museum note – what an extraordinary story! Does anybody remember the Kellogg's competition? Did you enter? Were you a lucky prize winner? If you have any more information on this mysterious competition, do get in touch.